After you turn the engine off, look under the hood and on the ground again for leaks. Listen for any noises such as hissing. Write down any unusual odors such as gasoline or burning. Pay attention to the wheels, where the brake pads are located. Wait a few minutes then restart the engine. 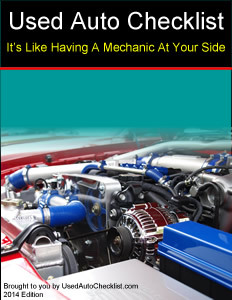 Sometimes an older car, truck, van or SUV will have difficulty restarting when the engine is still warm. Continue with the engine off. Caution: The tailpipe will be hot so be careful. After the drive, turn off the engine and check the tailpipe. Put the gloves on and use a rag to swipe the inside of the tailpipe. Black, sooty and/or oily residue indicates the automobile burns oil. White and powdery or no residue indicates good fuel combustion. Caution: Engine components will be hot so be careful. Recheck the dipstick a few minutes a few minutes after the engine has stopped. Remember, the normal color for motor oil is faint brown. If the oil is black, it needs to be changed and the filter needs to be replaced. Ignore the level of the oil because it will not be accurate until the automobile has been sitting for a while. Hold the dipstick out of the automobile to let it cool a while. Rub some oil between your fingers. It should feel smooth, not gritty. Thin or dirty oil with the smell of gasoline indicates internal engine problems. Recheck the levels of these fluids after the test drive. Warning! To avoid the danger of being scalded, do not attempt to remove the radiator cap when the engine is hot!